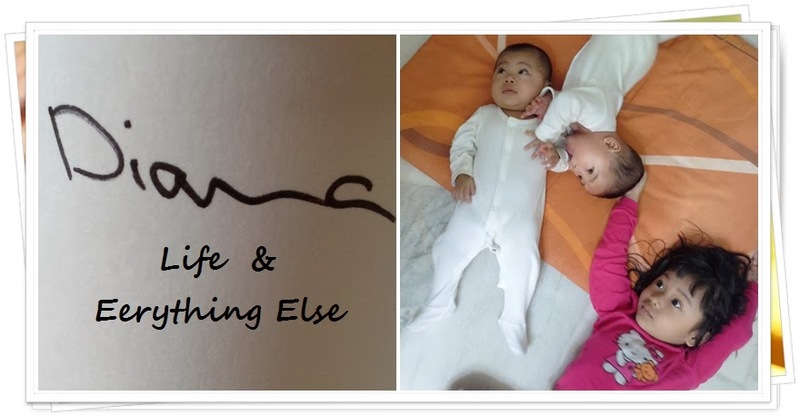 DIANA ABDUL MOLOK: LIFE 'N EVERYTHING ELSE: Monday Blues: Post Pregnancy Weight! Monday Blues: Post Pregnancy Weight! An article on babycenter said that "Your body needs time to recover from labor and delivery. Give yourself until your six-week postpartum checkup before you start watching your calorie intake and actively trying to slim down. And if you're breastfeeding, experts recommend that you wait until your baby is at least 2 months old before you try to lose weight. (If you're a nursing mom, you may also want to read our article on a healthy breastfeeding diet.)" So it has been almost 15 months since my baby 'popped'. That preggy belly, is still there. This didn't use to bother me much then, but it is now. I used to motivate myself with articles that I read - that if it takes 9 months to build, it will take some time to lose that preggy belly too! Being pregnant and giving birth isn't like popping a balloon, popped and flat it goes. No it doesn't work that way. But wouldn't you want to lose all that weight when you think your appetite is out of control, and that old clothes still hasn't fit? A little history. I was 51kg before I got married, and 59kg within 4 months of marriage. Got pregnant and became 79kg by the time I gave birth. Went through a strict Malay confinement, and I lost quite a lot of kilos and became 61kg! Then I started work, breastfeeding, pumping and just got hungry all the time. Several months after, I gained again up to 63kg, and now while typing this I am 65kg and still growing. May not sound serious to you, but heyyyy its my body I have the right to be concern. Though, reality check, I will probably never go back to being 51 or 59. LOL. I am sure many other mom feel the same way I do. Feeling pressured about losing weight. In my case, the office mates are actually making fun of me being fat, and feeling hungry all the time. Does this hurt? Yes, it is. Not just that, my husband is also being mocked. Hurts even more. So what if we are a couple of fat parents. Do we try hard enough? I did, maybe my husband didn't but I'll make sure he does. To my husband, it is enough that we love each other even though we are not 'pretty' people. We are definitely in the same shoe Diana.. Gained ~20kg++, but still havent lost all of them yet. Guess what, I'm currently 65kg too. Hehe..
Jaga makan la kot yang paling penting (dan yang paling susah nak buat). Kalau exercise, I would try to find time to swim. Lagipon my daughter suka main air. So take turns with my husband pegang die. Sorang swim, sorang main air dgn Inas. At least enjoy the time together jugak..